A new study published in JAMA Pediatrics suggests that “heading” a ball is the main cause of concussions amongst soccer players. Heading is used as a method of shooting or passing during a soccer match; it occurs when a soccer ball is intentionally bounced off the head of a player. In some instances, for example when multiple players are attempting to head the ball, player-to-player contact occurs—which can result in a concussion. The study, led by a team of researchers at the Colorado School of Public Health, was conducted over a nine-year period from 2005 to 2014 and analyzed data pulled from a large sample of high schools. Study results reveal that 332 concussions were sustained in boys’ soccer during almost 1.6 million high school-sanctioned soccer games or practices. 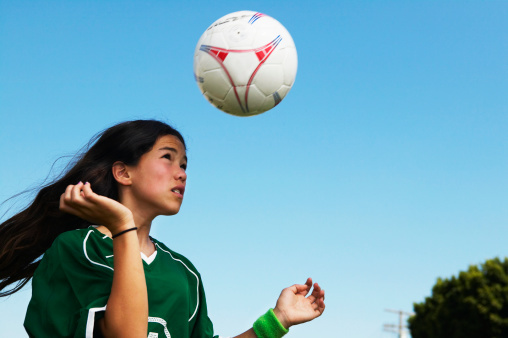 There was an increased number of concussions in girls’ soccer: 627 concussions were sustained during almost 1.4 million high school-sanctioned soccer competitions or practices. The study further suggests that player-to-player contact is the main cause of concussions for both male (78.1%) and female (61.9%) players. A concussion is a type of brain injury caused by a jolt or a blow to the head, which disrupts the brain and its functions. Lam, P., “Soccer players heading balls ‘at increased risk of concussion,” Medical News Today web site, July 14 2015; http://www.medicalnewstoday.com/articles/296643.php.